In the bow industry, compound bow is successfully considered as one of the best options for hunting because of high accuracy and convenience. There is a great number of compound bows available on the marketplace in shapes, sizes, prices, designs, etc…This is the reason why we gladly help you narrow down your decisions by recommending PSE Madness 30 70# Ready to Shoot Compound Bow as an out-standing option. It has high suitability with different types of customers, especially in hunting or 3D shooting. Therefore, if you are looking for an efficient companion for your picnics, camping or hunting, this type of bow is completely for you. Keep on reading and decide whether the compound bow is suitable for you or not. Let’s get started looking at the first impression of PSE Madness 30. In addition to eye-catching design, it is also great for long-period hunting thanks to the surprisingly compact design of about 3.8 pounds. As a result, users will find it convenient to bring the tool along with them on long adventures. PSE attempts to deliver a full package of accessories to users, including an Aires sight, a peep sight, a Whisker Biscuit rest, a Shadow quiver, a Flexxtech 3 stabilizer and a nock loop. Although each of them plays specific roles, they work well with each other in boosting the bow effectiveness. There is no additional tool required for setting up bow establishment. Therefore, it takes you extremely short time to assemble and disassemble different components of the bow. Check out all gorgeous features of the PSE Madness 30 Compound Bow in a comprehensive way. It strongly proves that the device has perfect combination between design and function, which allows high satisfaction of hunters. Although this bow is compact, don’t make a mistake that it is less efficient. In fact, it could offer high speed up to 322 feet per second, 23 ½ inches up to 30 inches in draw length. A typical characteristic of Madness power is that it features up to 80% let off. This factor contributes to create great balance, less vibration and hand shocks for better accuracy, especially within 10 yards of distance from your games. It is evidence that the tool delivers powerful draw weight from 50 to 70 pounds. Normally, hunting often requires at least 40 pounds of draw weight. Freely make up your own mind about choosing the best option for hunting targets. One fact is that it is easy to adjust the draw length of the bow to meet your needs and demands. Most of users feel pleased with suitable axle to axle from 29 ¾ inches to 30 inches. Within 20 to 30 seconds, you could easily change the bow draw length without any difficulty. Talking about the durability of using the bow, it is very awesome for long-lasting usability for years. A question raised in our mind is what makes the compound bow become so active? The answer is so simple. All parts of the device are covered by high-quality materials to efficiently avoid corrosion over time. Get it now and enjoy this gorgeous feature! There are several important elements you had better put into your consideration before purchasing a compound bow. The best product has to be synonym with your requirements and budget well. For instance, you could check different reviews about product performance, discount price and promotions to get the best purchasing result. It is advisable for you to concern about the bow power, accuracy, and silence before investing in a good compound bow. All in all, purchasing a product means you are engaged into a big financial investment. 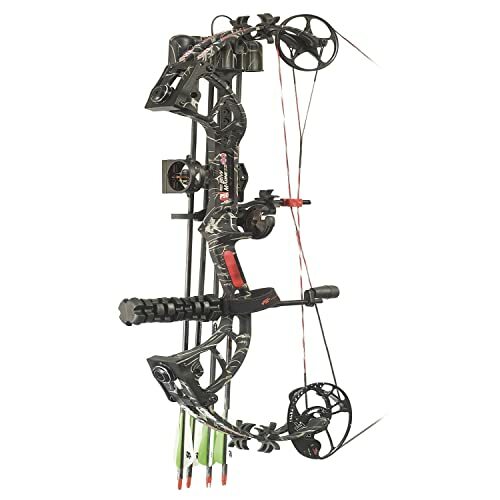 With PSE Madness 30 70# Compound Bow, it pleases different types of customers in many aspects. The tool is not only eye-catching, but also effective in doing multi-functional tasks. Let’s try and enjoy this incredible compound bow. And dont forget to check out my other Hunting Gear Reviews and Guide!